Hi, I'm Daryl Farmer. Thanks for coming to my GoFundMe page. I'm an English wildlife rescuer and in December 2016 I will say goodbye to my partner Sabine and her 12 year old daughter Elli for about three months, leaving the safe haven of my home in Winnie the Pooh's Ashdown Forest, England to risk my life pretty much every day doing the scariest and toughest thing I've ever taken on (and I've done a few!). 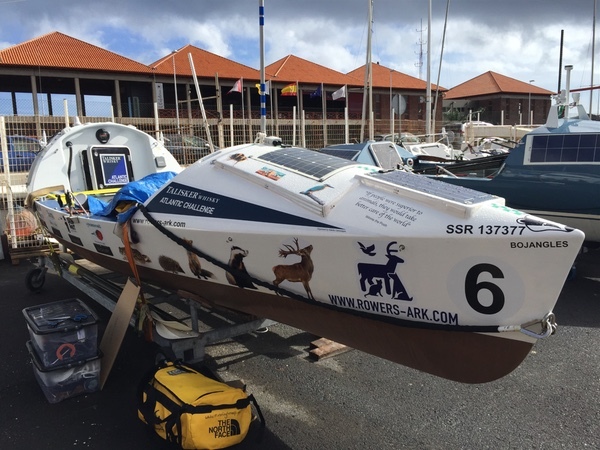 I'm attempting to ROW SOLO across the wild expanse of the ATLANTIC OCEAN as one of just 4 solo rowers in the Talisker Whisky Atlantic Challenge. To put the size of this task into perspective, fewer people have successfully rowed an ocean than have been into space or climbed Everest. The journey will involve me being at sea, alone and unsupported, rowing 16 hours+ every day for 3000miles, dealing at worst with huge waves, storms, sleep deprivation and sharks, and at best with salt sores, blisters and an aching back. There is no safety net here - no support crews or boats. If I get into serious trouble, I have to sort it somehow - or hope that a passing ship notices 'Bojangles' - my floating home for 3 months! This really could be life or death. So why am I taking on such a dangerous challenge? Well, even greater than my fear of what I'm taking on, is my desire to raise awareness for a charity really close to my heart. In 2012 I lost my fantastic Mum to mis-diagnosed kidney cancer I am therefore dedicating this row in her memory. It was my mum who instilled a deep LOVE and RESPECT for NATURE, wildlife and the WORLD around us, which has inspired me to become involved with wildlife rescue to do my part for for the increasingly pressured planet and wildlife. All my previous challenges have been to raise money for worthy conservation charities and organisations. It is now widely accepted that we are heading towards the sixth major extinction on planet earth, the difference this time however, is that it is man made. We owe it to our future generations to fight for the amazing but voiceless and endangered creatures that we are lucky enough to share this world with. As a wildlife rescuer I hope my row will raise awareness for the future of our planet and raise a significant amount of money for East Sussex Wildlife Rescue and Ambulance Service (WRAS). WRAS is typical of the multitude of global wildlife rescue organisations that specialises in a very localised area with a very specific goal. The time someone will learn about WRAS is the time they find any wildlife in distress and reach out for help. We spend our days rescuing and assessing injured and wounded animals, rehabilitating them as appropriate and ultimately hopefully returning them to their native habitat. It is not headline-grabbing; but it is vital work in the preservation of the worldwide natural environment and continuum. Financials: Taking on this challenge is, for us, hugely expensive and it's a massive financial risk. But I've got to do it - in memory of my mum and for my charity. Every dollar/pound I receive from funders will be split with 60% going to the charity and 40% going towards the cost of the row. Once those costs are recouped, then 100% of the monies received will go straight to the charity. Although this is a 'Solo' row, and it is only me on the boat, the thought of people around the world believing in me and the cause and message that this 'Rowers Ark' represents, will keep me pushing during the inevitable dark days which lay ahead, and for that I am truly grateful. So please donate, no matter how small, and be a part of this journey and a part of the Rowers Ark family. I have got some EXCITING news and I need your HELP! We have been offered an amazing OPPORTUNITY and I hope you guys are willing to SUPPORT Daryl even more! A GENEROUS rowing friend of ours has offered to match our total on our GoFundMe page up to the value of £3000. As it stands our total is £1590, if we can double that by the time Daryl hits the 1500mile mark that would be amazing then we will have a definite £6000 already! This is not only a rowing race but a rowing race with a PURPOSE!...it is a great opportunity for FUNDRAISING!! The East Sussex Wildlife Rescue Ambulance Service to help fund a new ambulance that is desperately needed to be able to see to the injured animal in need and provide emergency treatment! The Peter Andre Fund for Cancer Research UK to help fund the road show which are units for people who are too worried to see their GP, so they can drop in and get valuable medical advice, with the aim of catching cancer early! So I've been doing some maths! !...if you fancy sponsoring Daryl a 'Penny a Mile' you're looking at a £30 donation. We would need 50 people to donate £30 to reach the extra £1500 this would then mean our friend would make their £3000 company donation! Fancy getting involved? Then please please donate below and make me and Daryl extremely happy! I want nothing more than Daryl to be able to see how worthwhile his journey was!! We are grateful for all donations whatever the amount! So we are safely here at La Gomera, in the Canary Islands, getting ready for race start, and more importantly so is Bojangles! We've been busy turning her into the ark that she was always meant to be, highlighting the plight of wildlife around the globe, but specifically Daryl is taking this selection of British wildlife with him as they are what he works closely with as a wildlife rescuer with one of his chosen charities, and it's his goal to highlight how much pressure these animals are under, even in the UK. 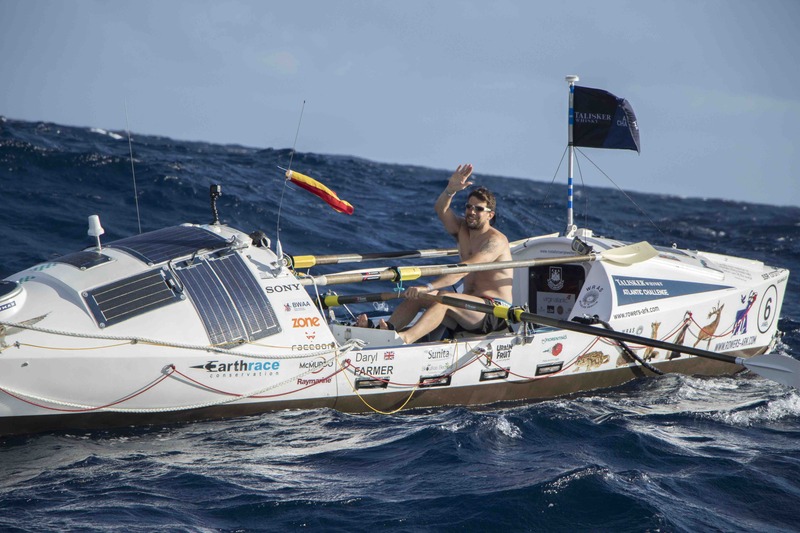 He has 3000 miles of lonely open ocean ahead of him, facing storms, sleep deprivation, salt sores and sharks - in a rowing boat!! He has stayed true to his beliefs even though it has put several potential sponsors off, this campaign was always about the wildlife and he has stuck to that. Could you sponsor him a penny a mile?! That would be a total of £30.00 on arrival in Antigua in around 3 months. Thanks for reading, we'll keep you updated!